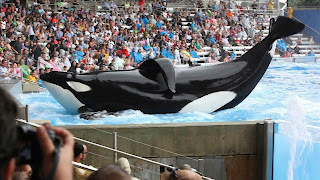 Tilikum in a scene from BLACKFISH, a Magnolia Pictures release. Photo courtesy of Magnolia Pictures. Photo credit: Gabriela Cowperthwaite. Gabriela Cowperthwaite's Blackfish is a jaw-dropper. It is concise, disturbing, relentless, and vital. The film is soul-crushing. It's that effective. Blackfish is an exposé of Sea World and shows the side of it that most are likely oblivious to. A trainer was killed by a killer whale at Sea World a few years ago and Sea World blamed the accident on the trainer. Blackfish looks beyond that lie and into what caused the death. What is presented in this documentary may make you lose faith in humanity and will make you never go back to Sea World (or any park that exploits marine animals) again (as you shouldn't). Blackfish works on every level. It reaches a level of near-perfection that few documentaries reach. Cowperthwaite has a wealth of eyewitness footage of events described and some powerful interviews by former Sea World trainers, whale hunters, a former sea park owner, etc. (Sea World declined to be interviewed on many occasions according to the film). The film starts with interviews with former Sea World trainers talking about how they got their start training and what drew them to it. After about 10 minutes of calmness, the rug is pulled and we get a glimpse into what really happens before Sea World gets their orcas and what happens when in captivity at Sea World. Orcas are separated from their parents and mistreated after arriving at Sea World. The amount of lies that Sea World throws at its visitors every day is astounding and Cowperthwaite explores this in great detail. It is a park built entirely on lies and the suffering of animals that are in some ways smarter and more complex emotionally than humans. Blackfish is paced beautifully, and while disturbing, is never so in-your-face that it becomes unwatchable. It features some heart-wrenching scenes, before briefly letting up to allow everything to sink in. The movie starts innocently and evenly-paced enough before exploding. When Cowperthwaite pulls the rug out and reveals all of the lies and deception, the movie's pace picks up rapidly, racing towards the finish. This movie is not one second too long. Blackfish deals in human emotions. It doesn't simply look at the animals and beg for our pity. The film allows us to connect to them on an emotional level, which was a brilliant move. It brings the viewer onto the level of the animal, something most documentaries don't do. What makes Cowperthwaite's film stand out above all is the fact that it is a great piece of filmmaking, not just a great documentary. It is marvelously-crafted and tells a very important story in a brief running time. It does not simply report. The best recent documentaries like Bible Quiz and Stories We Tell tell stories. They don't just report. I can watch the news for a report. Overall, Blackfish is that rare documentary that is a masterpiece, not unlike Sarah Polley's Stories We Tell, which was released earlier this year. It is passionate, unique, fascinating, well-researched, and essential. Sea World and parks of its kind need to be taken down and Blackfish provides a pretty compelling argument as to why.